Cathy and I are in Kokomo, Indiana. 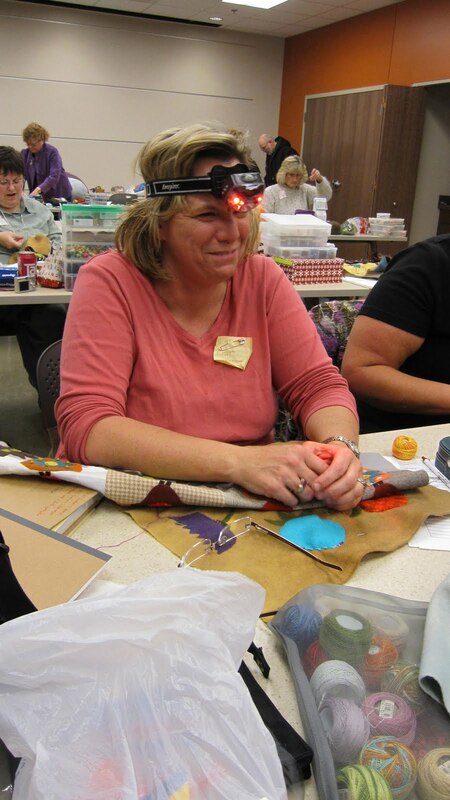 I taught a really fun creative workshop at the Kokomo Quilt Guild. Fun was had by all. 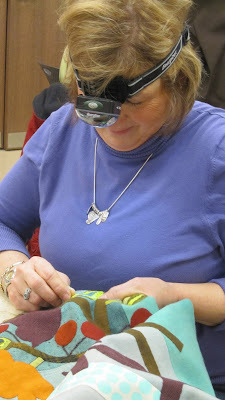 Many worked with wool for the first time and a few of the students told me this was really out of their comfort zone. 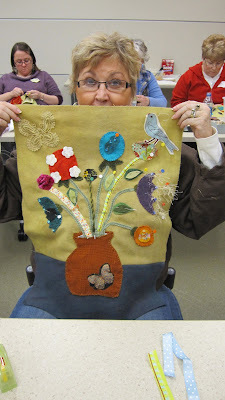 All 20 students did a fabulous job working with ribbons, textural fabrics and fibers. 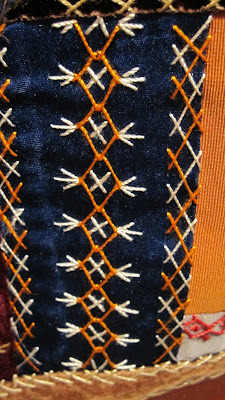 I am always amazed at the wonderful ways my students use ribbons. 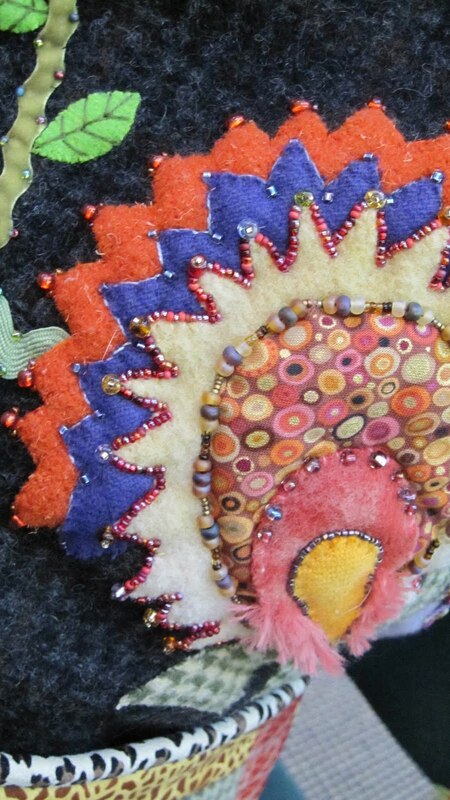 What a fabulous way to embellish a flower! We also worked on many stitches using lovely hand dyed yarns. As we wrote in our journals we talked about how many ways we could create stems. I love the texture on this piece. 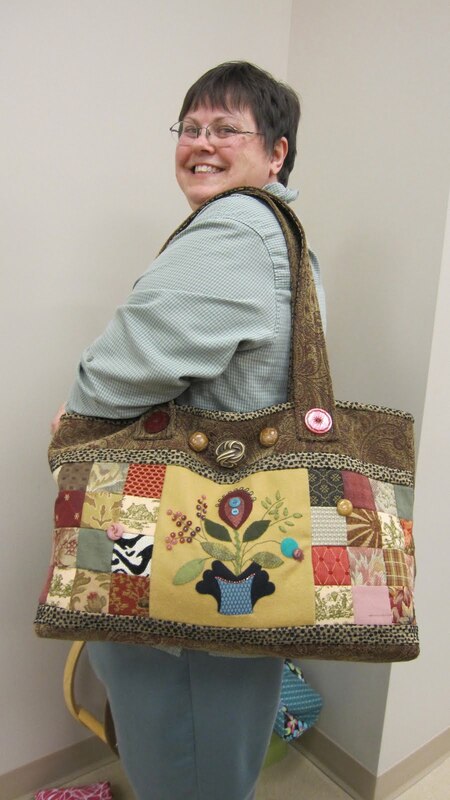 Dawn from Anderson, Indiana brought her Victoria tote to share. 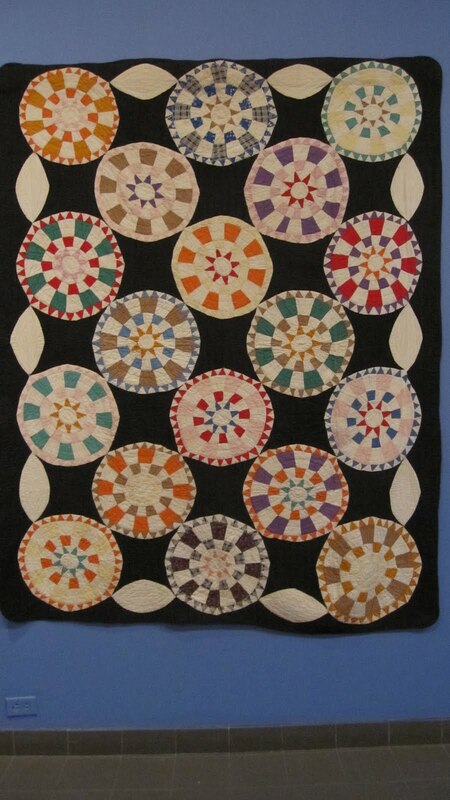 This is from my carpet bag pattern Victoria. 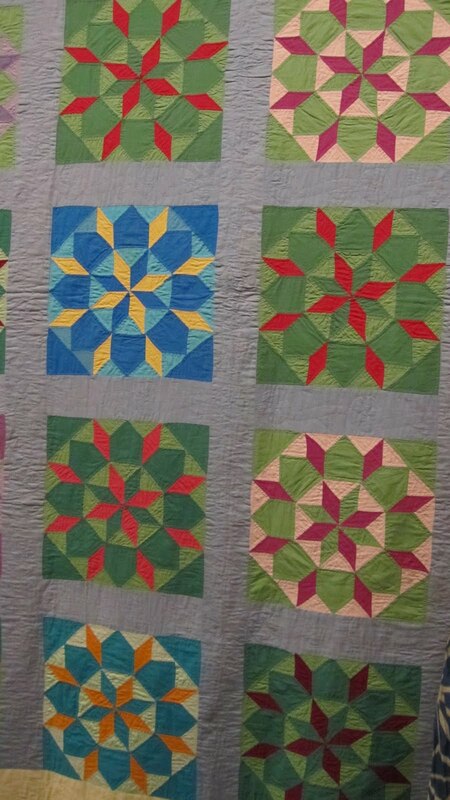 Her colors and techniques were wonderful. 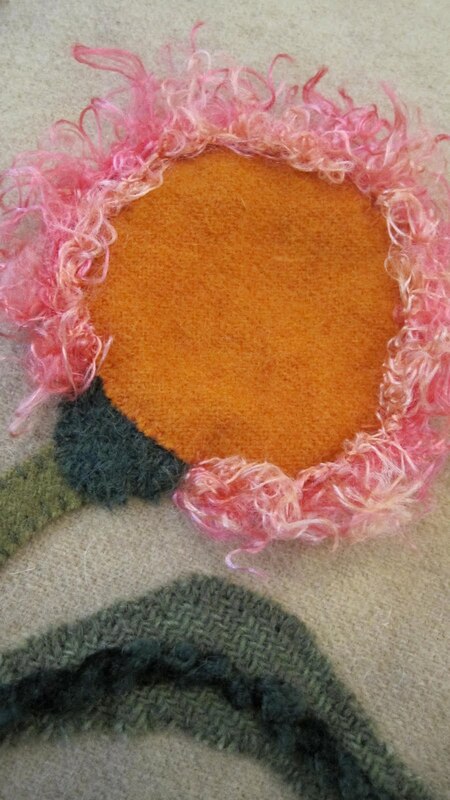 I do a lot of embellishment with hand dyed Chenille. Here is another very creative use of Chenille thread on this flower. 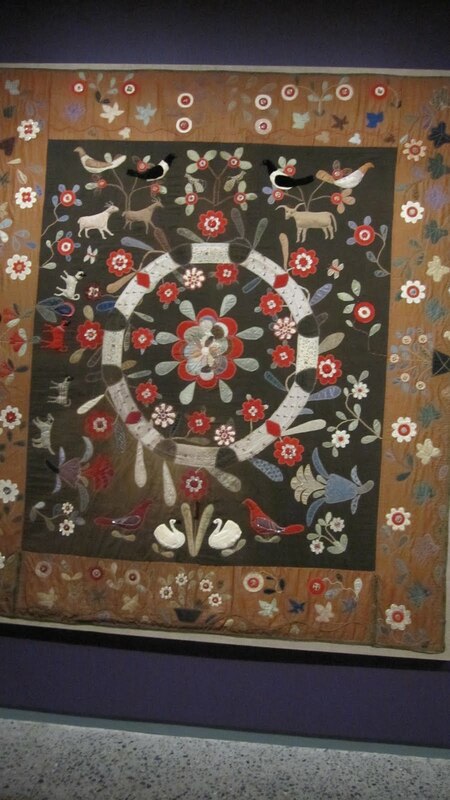 We have this wonderful bird fabric from Valori Wells on our website. 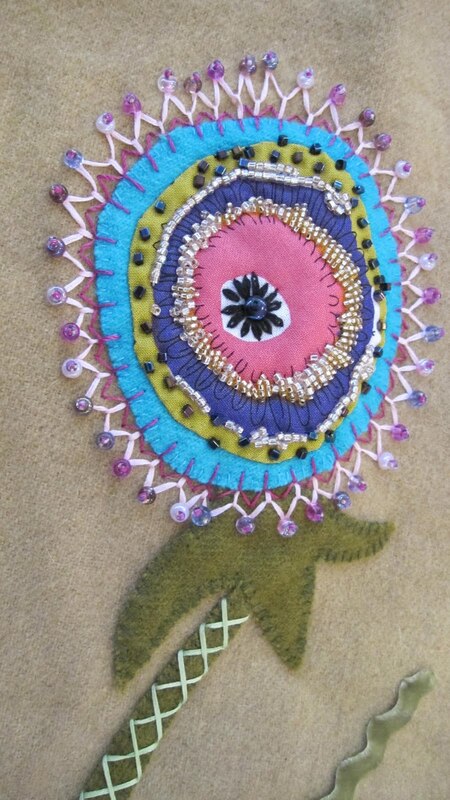 I love the way it was cut out to applique on this piece. 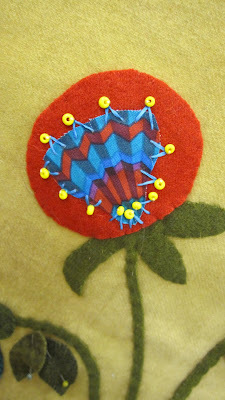 We also worked with beads and couching of threads. 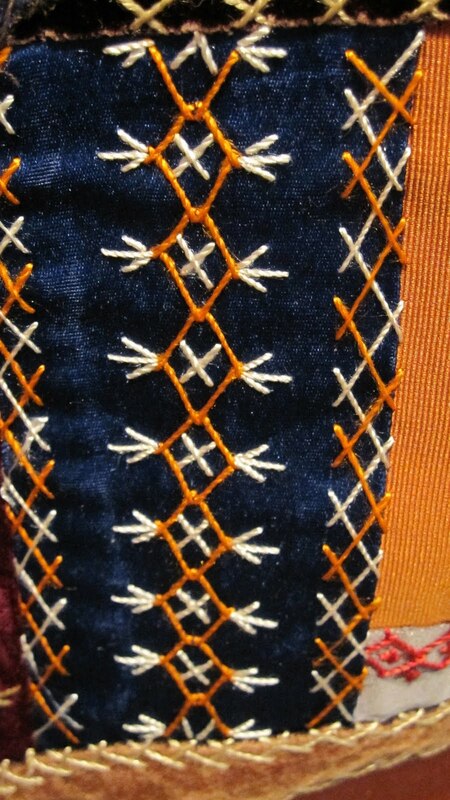 I am always amazed at how the stitching changes the appearance of a piece. Cathy tried out Pats headlight. They had a lot of fun selling the idea to others. I guess as we age any gadgets like this are helpful to many of us. Just wish they made pretty ones! We are setting up today to Vend at The Winter Woolen workshop at the Sieberling Mansion and Elliot House – 1200 W. Sycamore Street, Kokomo Indiana. 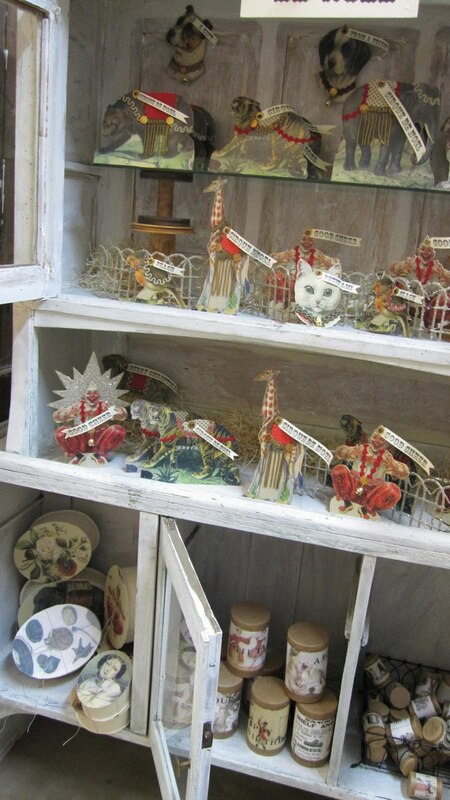 It is open Saturday 9am-6pm and Sunday 11am-5pm. If you are in the area come and say hi. We would love to see you. Cathy and I have just returned from a fun weekend in NYC. My son Andrew lives in Manhattan and it was great to have our own travel guide. 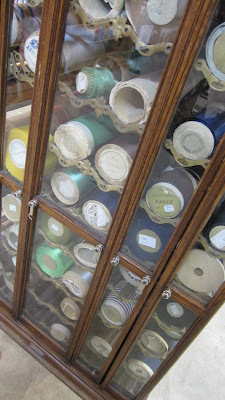 We spent a large amount of time seeking out wonderful ribbons, trinkets and fabrics. 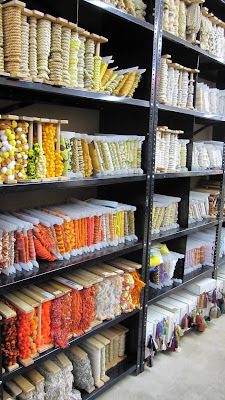 One of the treats of our visit was a visit to Tinsel Trading. We spent many hours in the store and ended walking out with a little bag of wonderful vintage ribbons. Our heads were swimming with all the great new projects we are going to create. On Sunday we took a trip to Eatily. 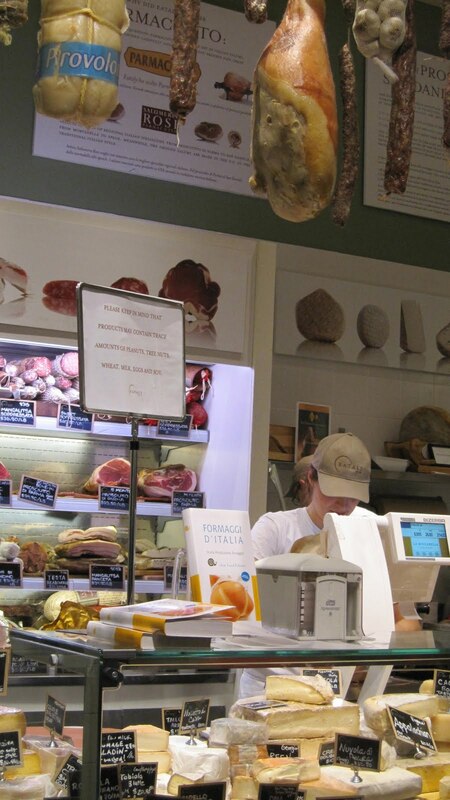 It is a wonderful store with 5 restaurants and every possible Italian food product you could possibly dream about. 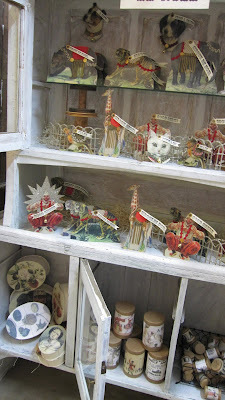 I would love to have just a few of these wonderful choices at home. Amazing cheese, wine, meat and dessert choices. 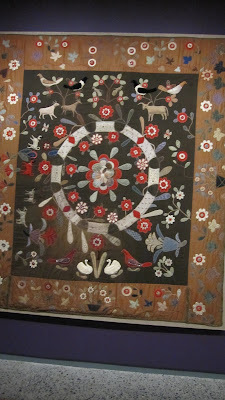 A trip to New York for me would not be complete without a visit to the Folk Art Museum. 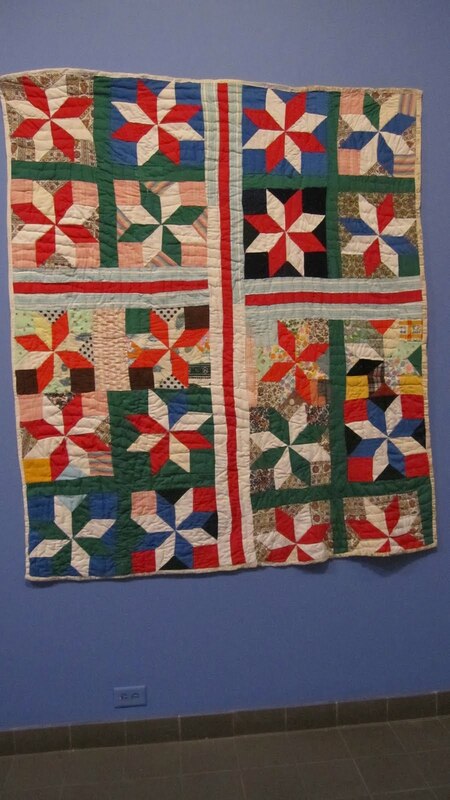 This year is the year of the Quilt and they had a wonderful collection of quilts on display both at the Lincoln Branch and the main museum on 53rd. The weather cooperated, we walked for miles and ate some wonderful meals. 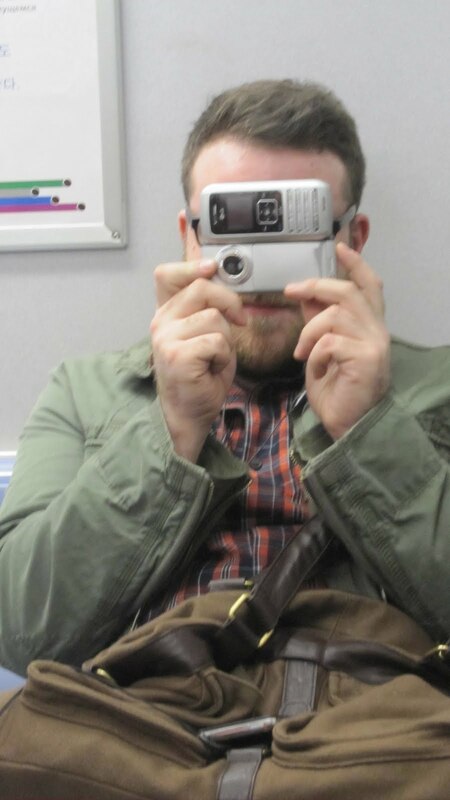 It was really good to spend time with Andrew and see how well he has adjusted to life in the Big Apple. My head is spinning with new ideas. I am now back home for a few days so a little time to create. I just spent a lovely few days in Des Moines, Iowa. 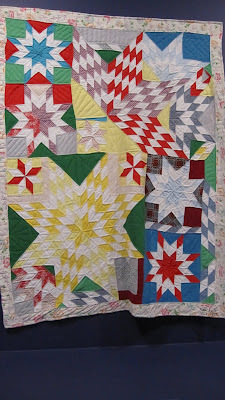 I went a few days early to stayed with my friend Jennifer. We had a great time stitching for two days, it was wonderful to take a little break. 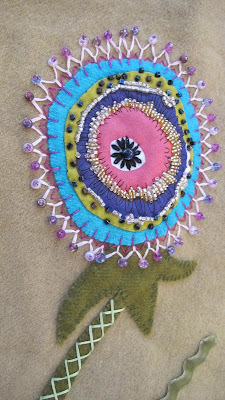 I then taught two full day embellishment classes. I always get excited when I see all the creative ideas my students come up with. On the Flower Pot class they layered there flowers, leaves, vase and berries with fun fabrics added stitching, beads and hand dyed threads for texture. 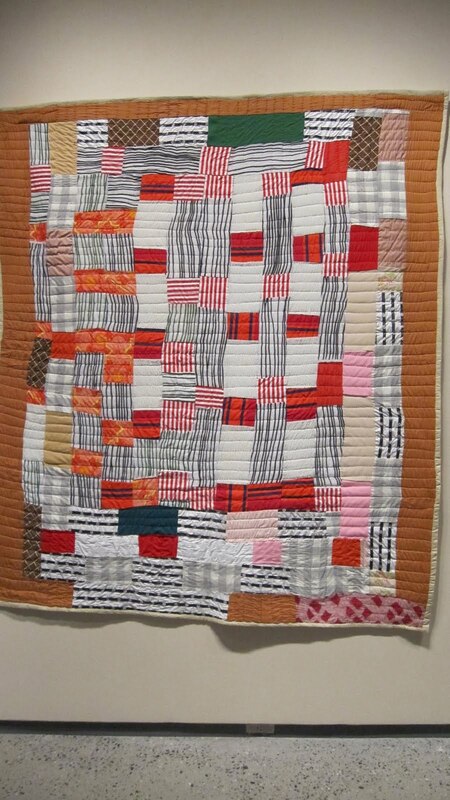 I love the combination of cotton fabrics with hand dyed wool. It adds a really fun element to the blocks. My sister Wendy hand dyes 40 colors of silk velvet for my website. 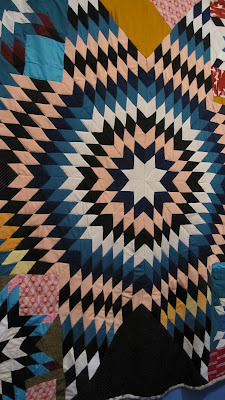 The texture that it gives on the wool pieces is wonderful and of course the colors are great too. We had a lot of fun using different ribbons for the stems. 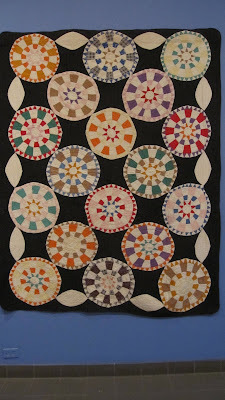 Each person attached them with different threads and stitches. 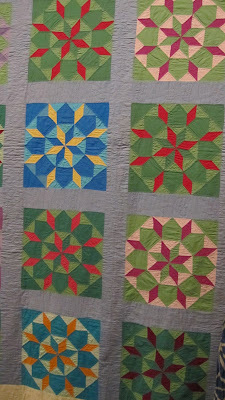 Many flowers were dimensional using ribbons and fussy cutting fabrics. 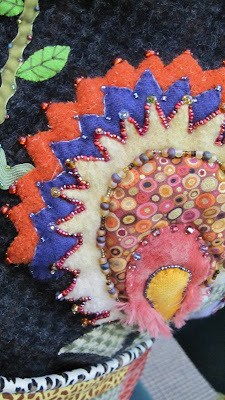 It is amazing how different a circle can be using different layering and stitches. These stems were stitched with seagrass and metallic threads. Deb brought her wonderful Duffel bag she made from my Journey Tote pattern in the Urban Sacs book. 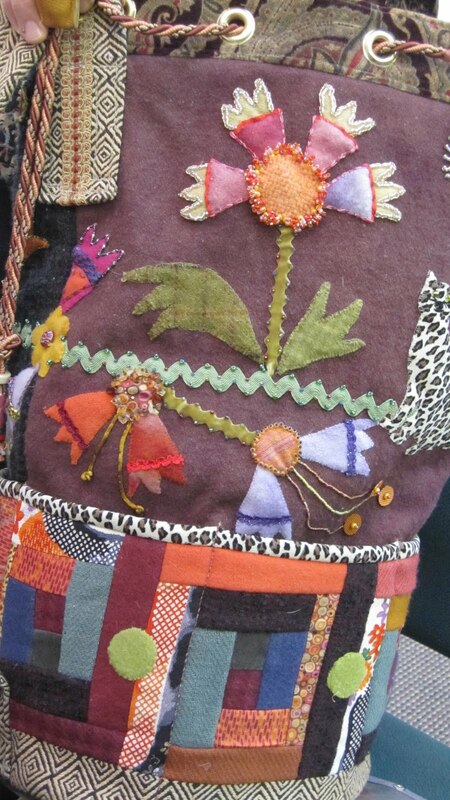 She must have spent hours embellishing as each element was layered with beads and stitches. I have been home for a few days now. It is cold and icy here at home. 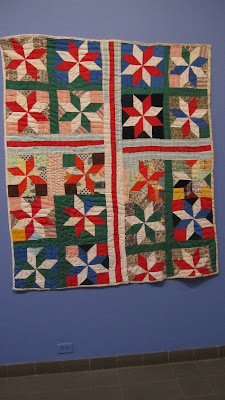 My trip this weekend to Dallas was cancelled due to bad weather so I have used my time wisely and spent the weekend catching up on emails, paperwork, writing my new book and stitching. It has been perfect weather to curl up and stay home. I spend a lot of my time exploring color in the dye studio. 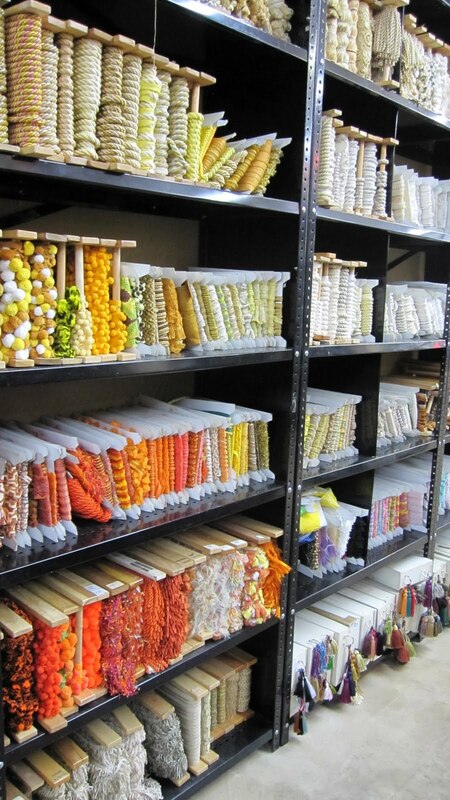 I create new formulas for my fabrics on a regular basis and looking for inspiration is a constant. I have often been asked how I come up with the ideas and so I thought I would start a series of posts about color and the resulting fabric. 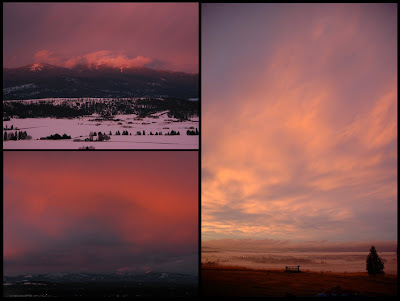 I am very lucky to live on a hilltop overlooking a prairie, beyond which is Mt Spokane. One of the things I enjoy the most is the 180 degree view and the feeling of expanse one gets from this vantage point. It is a constant reminder of how small we are and how exposed we can be to all the elements. We see a lot of different weather moving through and during certain times of the year we are treated to amazing displays of color. These photographs taken from the hilltop are my inspiration for this collection of fabrics. Gorgeous shades of orange mixed with blues. I decided to create a new fabric bundle of four different fabrics using this combination. 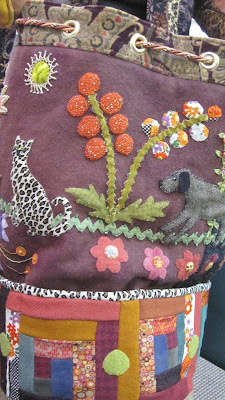 The fabrics are silk charmeuse, silk rayon velvet, silk matka and wool. I started with orange and then added various proportions of blue at different stages of the dye process. I kept no formulas and made no notes, I just played. They are spontaneous and therefore not exactly repeatable. 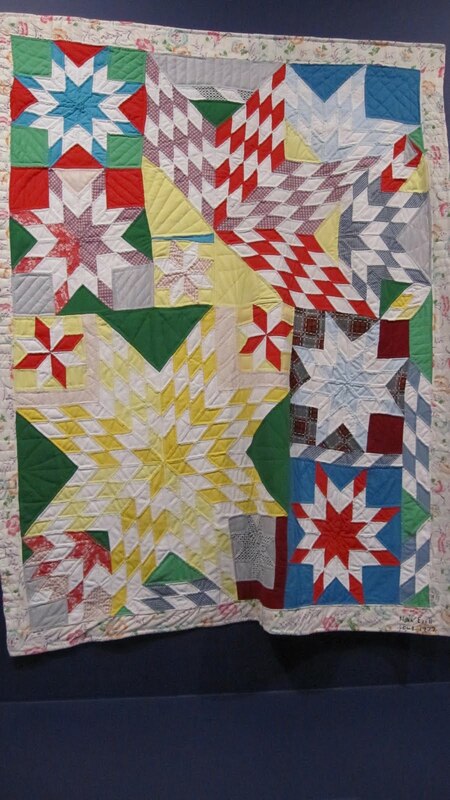 They are available through Sue in 1/16th yard bundles in limited numbers. I dyed just three yards of each. I am hoping to create a different bundle each month using a photograph or two for inspiration and each month tell a unique color story.